While the big boys were out testing on the big track, I was stationed over at DDT performing skid pad duty at the HANSON school. Since I was primarily manning the skid pad exercises I didn't get to do a lot of fiddling with the car. But a couple of sessions on track was still better than nothing. Definitely needed for an overhaul of this magnitude before a weekend full of racing. The car was supposed to get tuned on a ViPEC V88 ECU but a last minute glitch in some wiring meant we had to send it back to the manufacturer. So the car got tuned using COBB Speed Density as a temporary measure. This meant that little time was spent fine tuning and it was the first thing I noticed when driving the car. 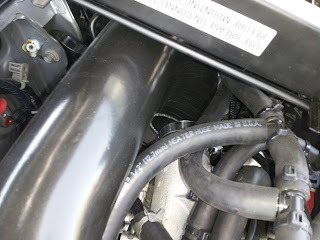 Part throttle was very choppy and power seemed to come on like an on/off switch. Combined with the almost instant spool-up of the Borg Warner EFR-6758 turbo, it made for a monster of a car to drive. Getting on the power too early in 2nd gear could make all four tires go squirrely. And the car pulls so hard in such a short distance that combined with the shorter JDM 6-Speed gears I'm now having to double downshift into some corners. Next on the list was setting up the new RaceComp Engineering T2 coilovers. It uses a 2.5mm allen key and I found that I had to jack up the car to get to the compression adjustment due to the low ride height and wide 255 tires. I admit that I've been spoiled by the simple, single knob adjustments of the BC Racing coilovers! I spent an entire break period setting up the coilovers when I could have been out on track. But the trade off was well worth it. On the track the coilovers soaked up the bumps much better than before. I'm still in the process of fine tuning them and this thread has been a great resource for starters. I ran into my first problem of the day on my 2nd run out. As I was powering out of the slow right hander at the downhill, I heard a "pop" sound followed by an instant loss in power. Checking my boost gauge I saw that I was only hitting 0 PSI at most. This was a familiar feeling as I had this happen to me at my very first track day at Shannonville in 2009 when I blew off a throttle body hose coupler. Checking the engine bay in the pits confirmed that I blew the 90 degree turbo outlet coupler off. Luckily, an easy fix! Other than the turbo coupler issue, no real big issues to report back. There was a knocking noise coming from the rear suspension area so Can-Jam is taking the car back to the shop tonight to get it sorted ASAP. I was experiencing more understeer than I'd like, but I'm sure that some time spent with the swaybar settings (or removal) and shock tuning will correct that. 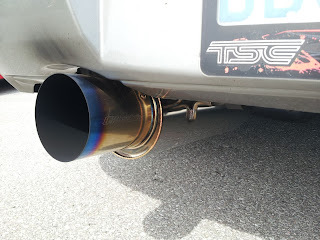 My lovely new GReddy Ti-C exhaust tip is already turning brown from heat. Oh yeah, and the car came with a surprise: a Neetronics DCCD controller! I'll definitely need some time to learn how to use it. Tomorrow is a practice day for me at Grand Bend, followed by CSCS Time Attack on Sunday. 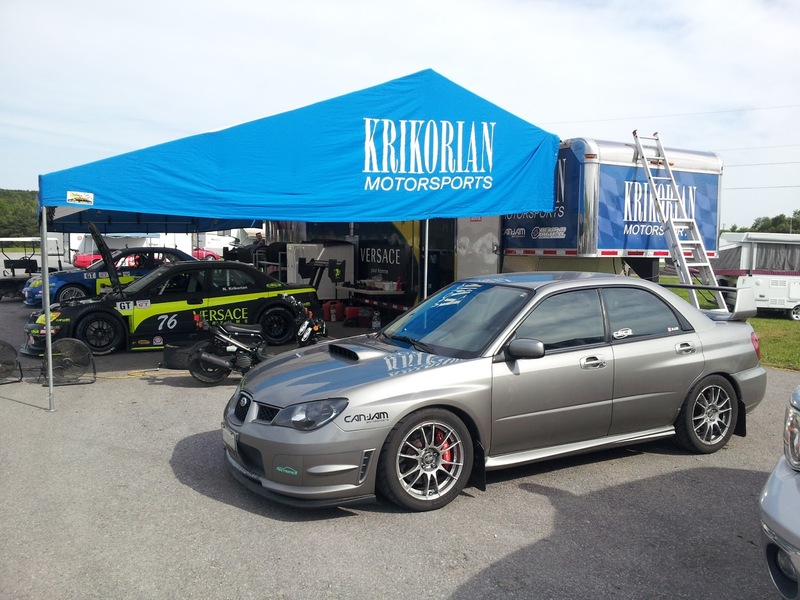 A hat trick weekend for track days. Tiring, but fun.